There seems to be a bit of a theme developing in this blog. 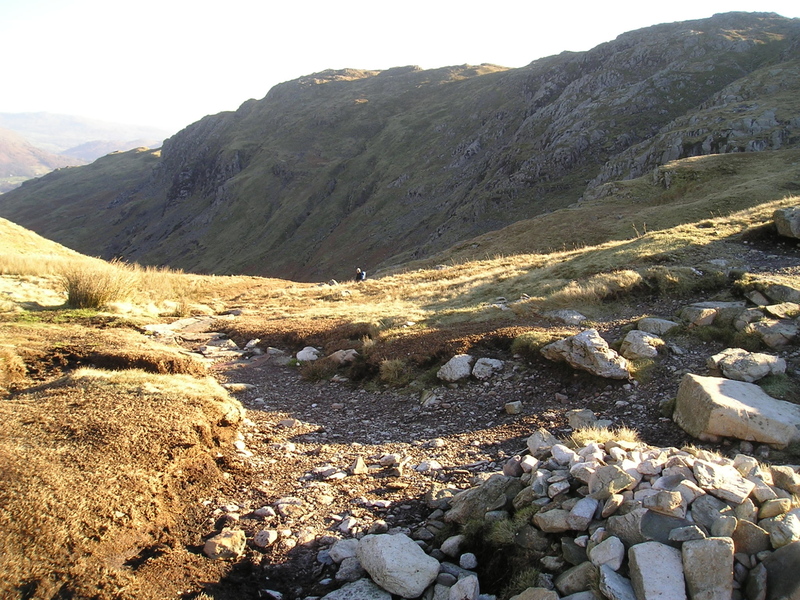 In #65 I described a warm and sunny February day on Cadair Idris in 2008. Last week in #67 it was a February ski trip up Pen y Ghent, which although snow-bound was again blessed by sunshine and blue skies. 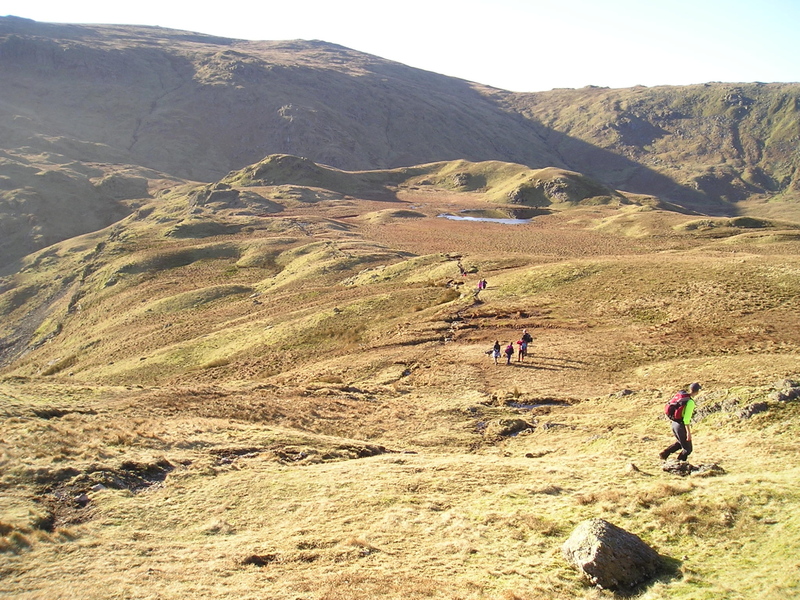 Circumstances kept us off the hills last week, so I returned to plunder the archives and found this – yet another warm and sunny day in February in 2007, this time in the Lake District. At 405 metres altitude. 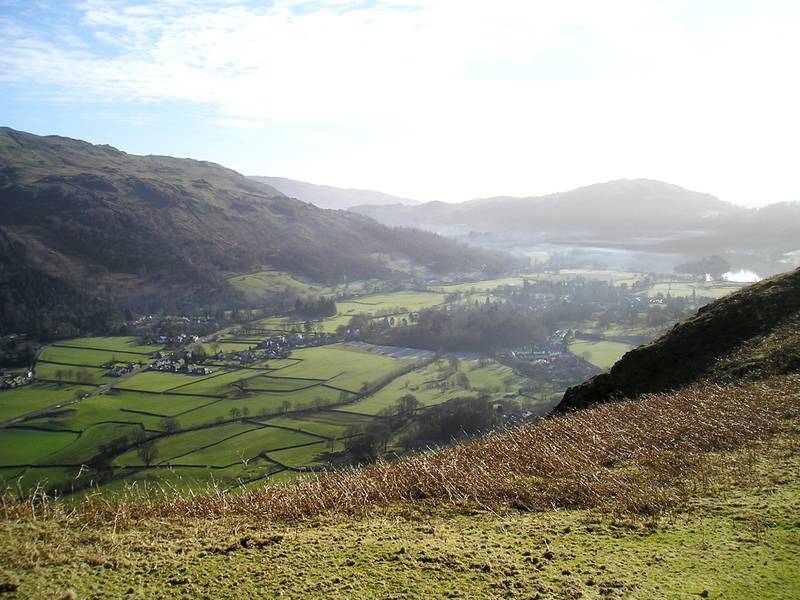 Helm Crag isn’t very high, even by UK standards, but it packs a lot in. The famous Alfred Wainwright was clearly impressed. 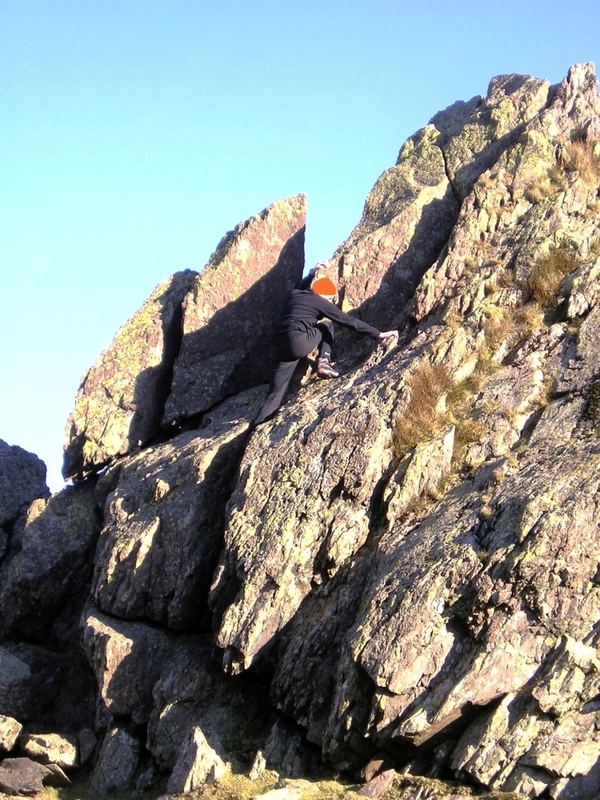 He wrote, “The virtues of Helm Crag have not been lauded enough. 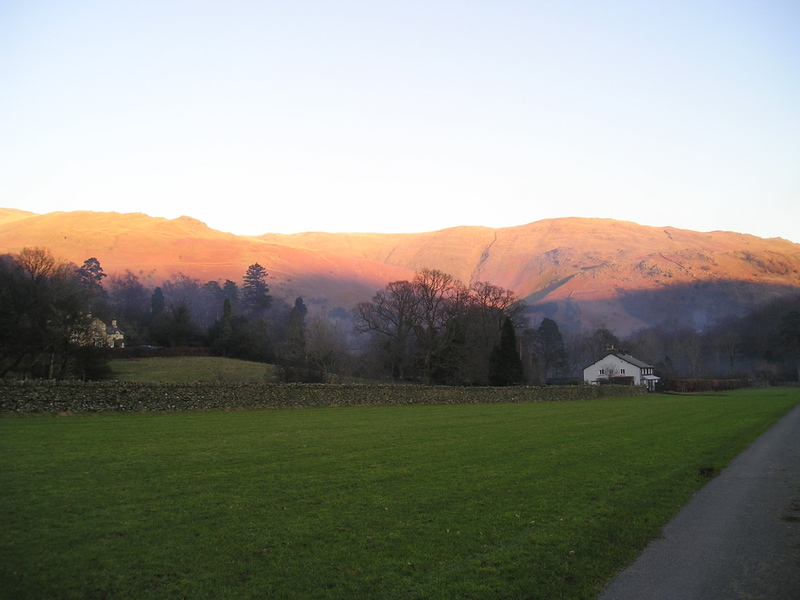 It gives an exhilarating little climb, a brief essay in real mountaineering, and, in a region where all is beautiful, it makes a notable contribution to the natural charms and attractions of Grasmere.” I think he liked it! I’ve got a bit of a soft spot for this route – it was the first one I wrote for www.walkingworld.com and since it first went online in 2007 it has been downloaded 526 times. 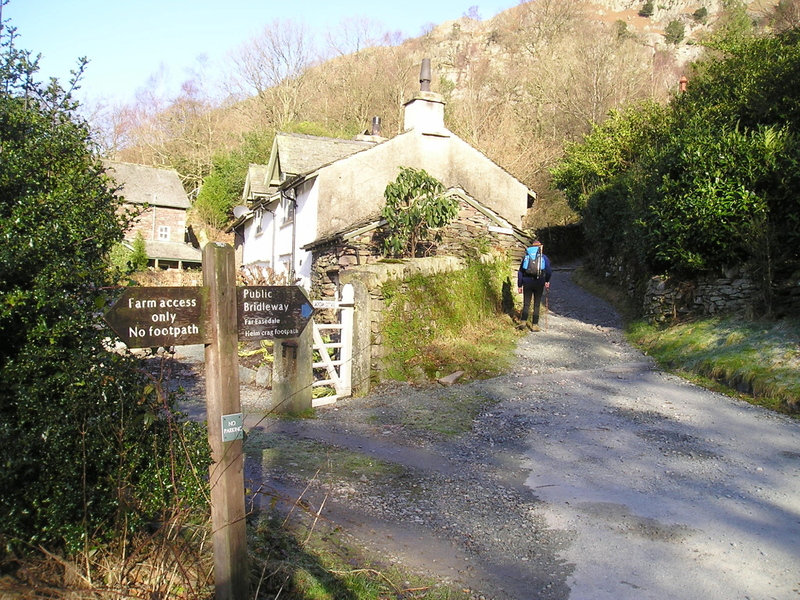 It’s a route of four parts – part one walks a quiet lane to Lancrigg before the path takes off through the woods. After that comes the open hillside, but at first the view looks back towards Grasmere and Rydal. In February 2007 Chris and I had set off on a warm, bright day. I was still new to the business of writing routes, and our progress was slowed by me constantly stopping to record the walk photographically – although I still use photos a lot, I now also use a digital voice recorder. As we emerged over the top of the southern flank of Helm Crag we had a view of what was to come – the soaring ridge above Far Easedale. 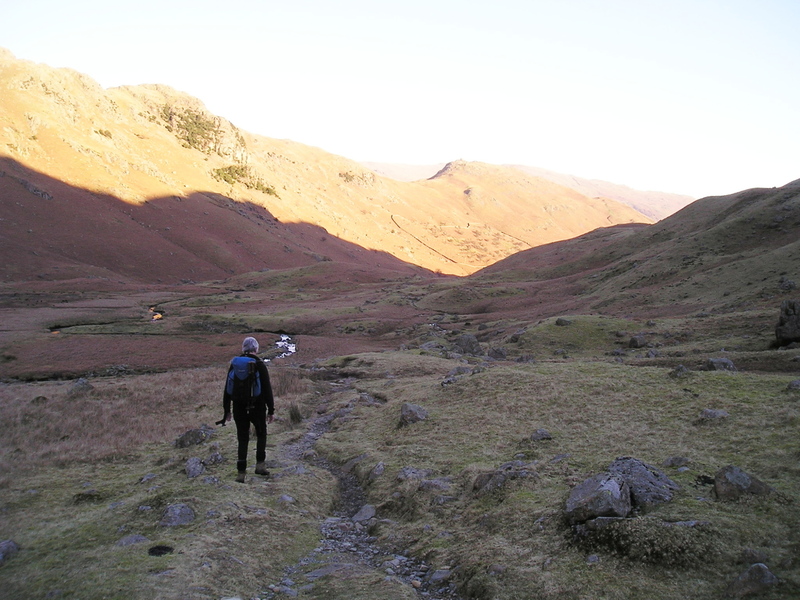 Before that, however, we still had part two of the walk to deal with – the summit of Helm Crag. The summit in this case is unusual by Lake District standards in that it can only be reached by climbing, and by that I mean by climbing rock! The author mucking about as usual …. By rock climbing standards it isn’t a climb at all, and the UK term of ‘rock scramble’ is more accurate. However, falling off would certainly hurt, and pride would likewise be damaged if the Rescue Team had to be called to assist with the descent. 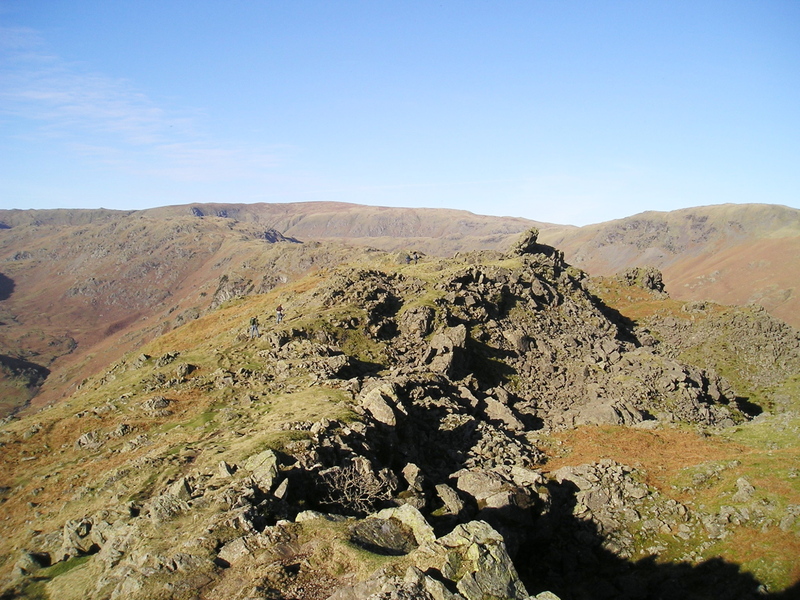 For these reasons, most of the walkers who reach the top of Helm Crag never actually make the summit, and that’s including Alfred Wainwright! Following on from Helm Crag comes part three, a glorious switchback ridge giving great views of the surrounding hills. What at first looked as though it might be sharp and technical is found to be broad and easy underfoot, good fell-running country in fact. 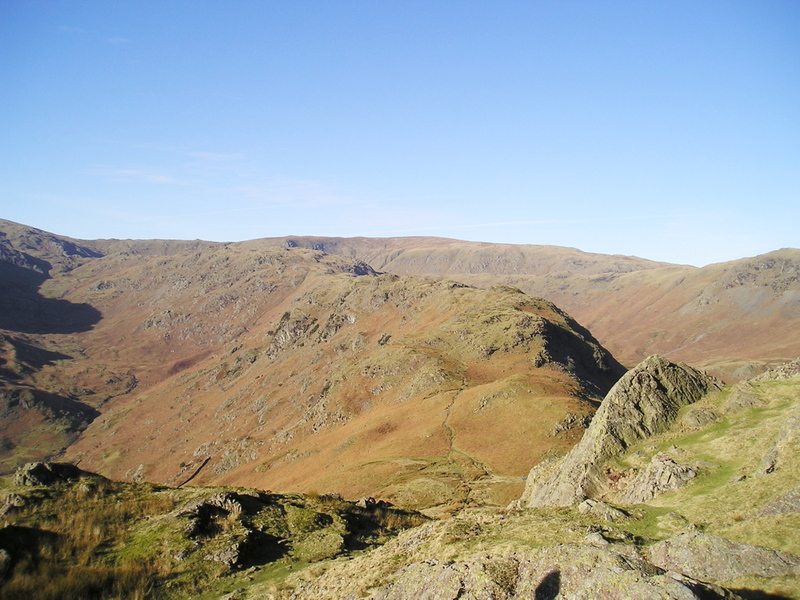 One thing soon becomes immediately obvious – the crowds who flock to the flat bit of ground below the very top of Helm Crag usually don’t go any further. The lack of crowds is welcome after the bustle of the first part of the walk. The undulating ridge allows rapid progress to a narrow col at Brownrigg Moss. From there the fourth and final part of the walk returns down Far Easedale. 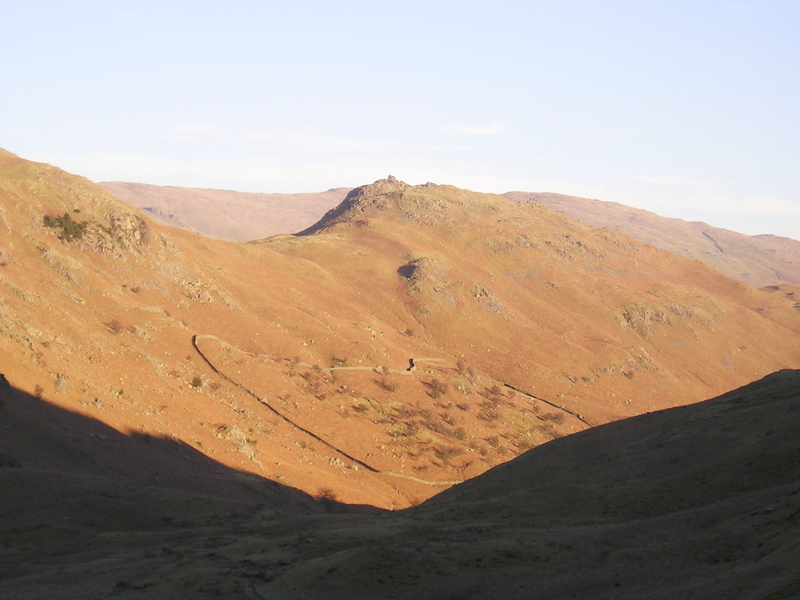 In the valley of Far Easedale - Low afternoon sun in February plays havoc with photo exposures, making the ridge bright and the valley dark. 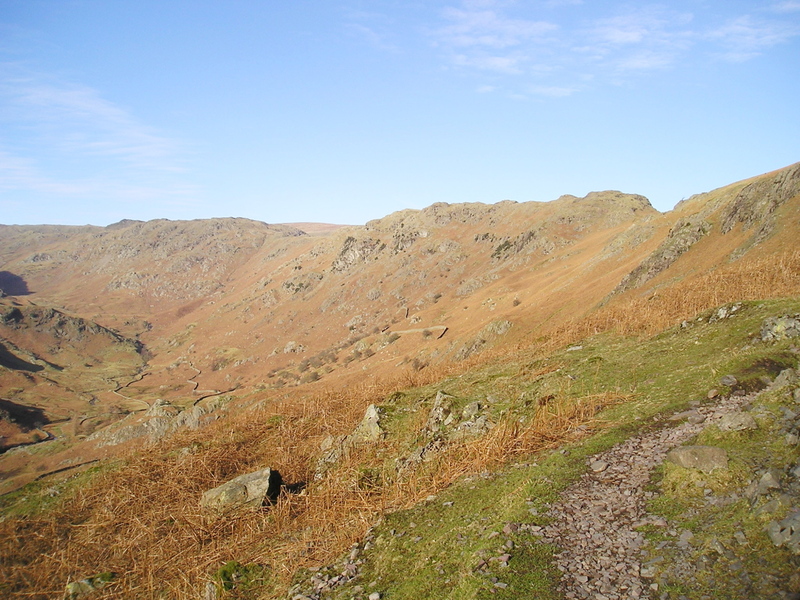 Far Easedale comes as another surprise – it’s remarkably wild considering that it is a mere 5 kms (just over 3 miles) from Grasmere. The stream has rocky pools that would be a joy on a hot summer day, and there are quiet corners for a picnic. In February though, the streams are icy, the days short and the low sun makes photography challenging. A quick return as the sun started to dip was the perfect end to a perfect day. p.s. To see the Walking World version of this walk click here. This entry was posted in 2. Lake District and tagged hillwalking, mountains, photography, scrambling, Walking World. Bookmark the permalink. Nice write up Paul. I have been so busy of late I need to catch up on my blog writing and reading others like yours . 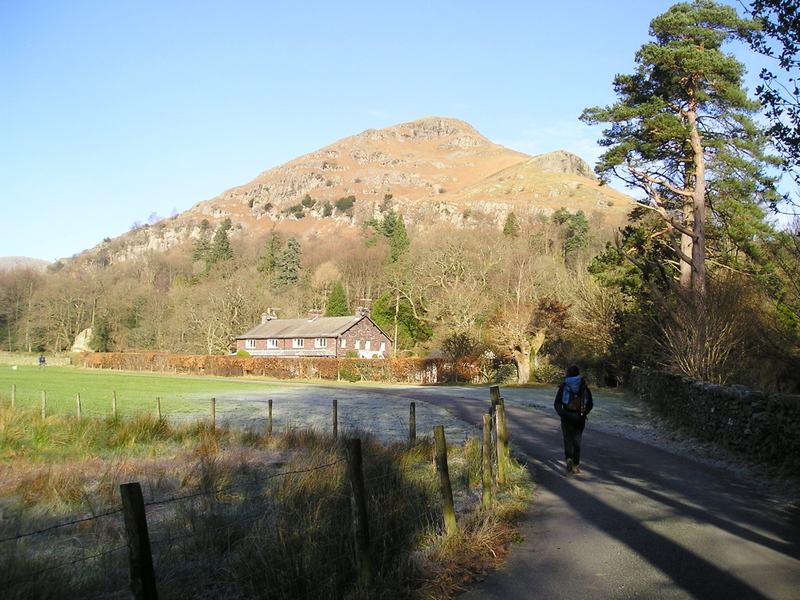 I have never been up this iconic hill – Helm Crag, perhaps when I am next in the area ! I am working on it now – So I will post soon ! I read your taster on LinkedIn and thought you were going to be writing about Yewbarrow – forgot Helm Crag as I haven’t done it for years. 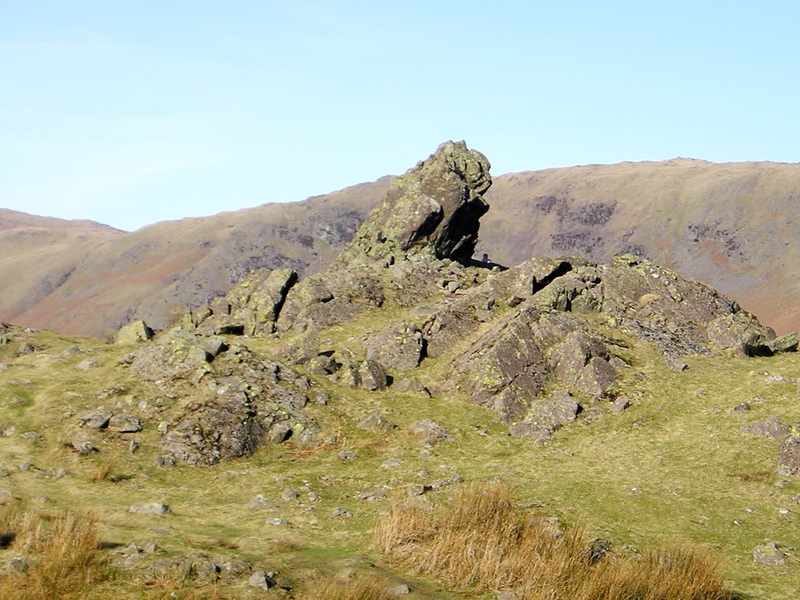 I used to love the round going from there, along Gunson Knott, Calf Crag and eventually coming down via Steel Fell/Cotra Breast – superb round. Great report and lovely, warm photos – my favourite kind 🙂 I have to admit to only clambering up the other summit – Richard took a photo of me and you could tell, even from quite a distance, that I’m totally ill at ease up there! 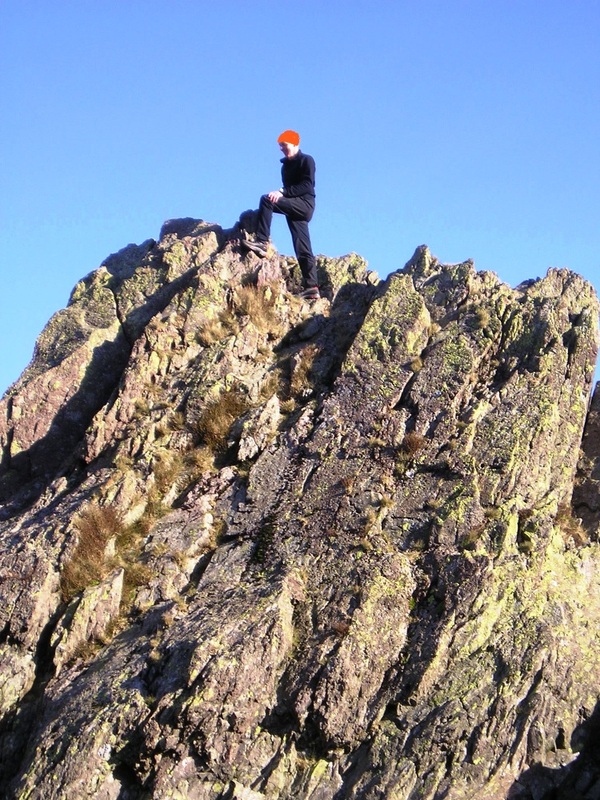 One of the first times I went up Helm Crag was when Deer Bield was still there (on Tarn Crag I think) – wish I’d got a photo of it before it fell down! Has Deer Bield collapsed, then? I did a rock climb there called ‘Deer Bield chimney’ many years ago, whilst another two mates were doing Deer Bield Buttress, a much more difficult climb. Although the chimney route was easier, there were already dire warnings about loose rock, and I remember that the guy I was climbing with that day wasn’t much impressed by the soundness of the rock. I’ll have to check it out on t’internet. No, no! The OTHER top up there – there’s an easier sticky-up bit next to it. I didn’t really look at the main one as I’d been told it was ‘climbing’ – maybe I should give it a try but, like you say, it’s getting back down though! It would be a very embarrassing fell to get rescued off! Yes, I understand what you mean – I’m coeliac (late diagnosis) and my first bone density scan showed that I also had osteoporosis through not absorbing calcium. I’ve been on alendronic acid and calcichews for five years, and the last scan showed an improvement – I might even be off the alendronic acid this year. Mind you, I don’t think about osteoporosis when I’m above a big drop – I just think about how much it’s gonna hurt if I come off!! Ouch – I have friends who are coeliac and I don’t think they’re aware of the potential for osteoporosis through not absorbing calcium. Think I’d best tell them to go for a bone scan! I didn’t think you ever achieved an improvement, I thought bone density that was lost couldn’t be regained? But my second scan showed I hadn’t got worse in 10 years so the alendronic acid etc. must be staving it off. I’m also on Osteocare Liquid (or you can get their unswallowable chunks of limestone pills which stick in your throat or nasty chewable versions). It’s great stuff as it has all the requirements for bones, i.e. calcium, magnesium, zinc and Vit. D and is easy to take. I take double the recommended daily dose. You can stir it into porridge in a morning which makes the porridge seem more creamy or just take it as it is. We even gave it to one of the geese next door when it got osteoporosis – at a modified dose of course! Enjoyed reading that – nice write up. 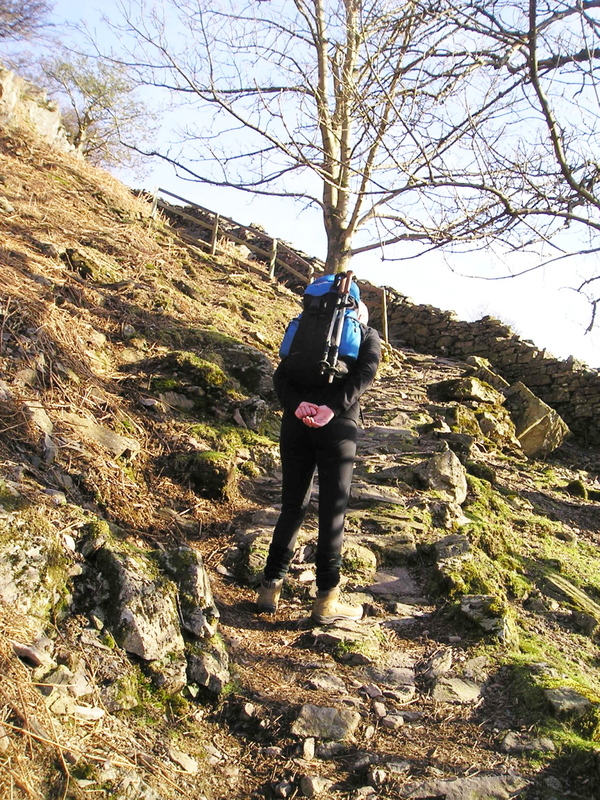 Some of the smaller hills in the Lakes make for some of the best walks I find, but Helm Crag has so far eluded me. When I get there I’ll see how brave (or not) I am when it comes to the final scramble! Thanks for the kind words, Pete. 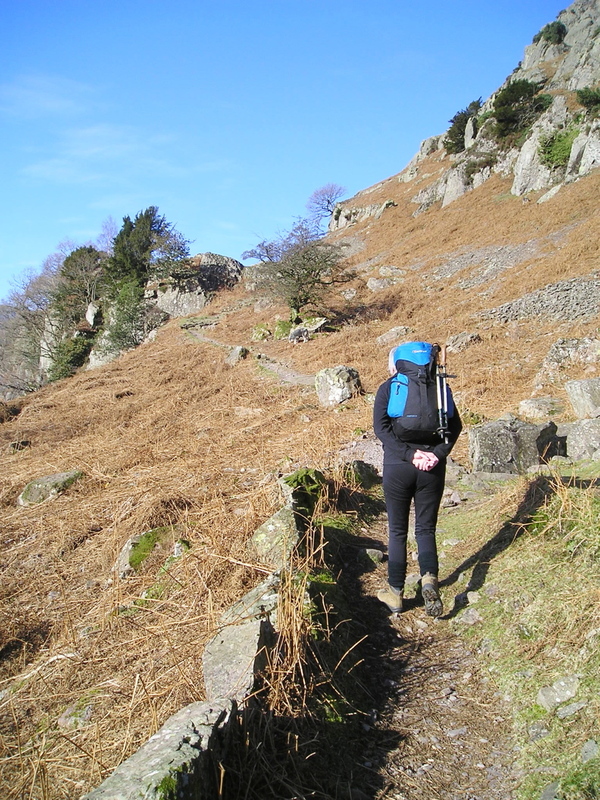 You will have a good day on Helm Crag, scramble or not, but the extended walk into Far Easedale makes it for me – surprisingly wild and unspoiled!